I found this video while looking for more information on John Rankin and was going to include it in that post, but since this video also discussed another member of the Underground Railroad, John Parker, I decided it would be better to start a new post for a discussion of Mr. Parker, who may be even lesser-known than John Rankin. It starts discussing Parker about halfway through. I had some trouble embedding the video, so if it does not work (I have had trouble with the sound), please use the link below it. Born in Norfolk, Virginia on February 2, 1827, John Parker was the son of a free white man and a slave woman, not an uncommon occurrence in that era. At the age of 8, he was sold to a slave agent. This agent then sold him to a new master in Mobile, Alabama. According to Ohio History Central John's new owner, a doctor, took the unusual step of teaching his new property to read and write and even permitted John to work as an apprentice in a local foundry. John was later sent to New Orleans, where he worked in another foundry and at the local shipping docks. He saved money and was able to able to purchase his own freedom at the age of eighteen for $1800. In 1845, the year he purchased his freedom, he moved north to Indiana, where he found work in various foundries close to Cincinnati, then one of the largest cities in the country. 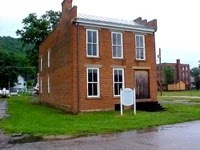 In 1848, he opened a general store in Beachwood Factory, Ohio, and in 1850 moved to Ripley, Ohio, located along the Ohio River, about 50 miles southeast from Cincinnati. In the years before arriving in Ripley, he had started his life as an abolitionist and conductor on the Underground Railroad, helping escaped slaves find their way north. Once in Ripley, he was able to make many trips across the river into the slave-holding state of Kentucky to help more runaway slaves cross that river into the free sta te of Ohio, where they hoped to find their freedom or a way further north, farther away from the slave states. He helped perhaps hundreds of these individuals make their escape, sometimes taking them to homes of other abolitionists in or around Ripley such as the Reverend John Rankin. Interestingly, Parker did not associate himself with religious groups or churches as did Rankin and many other abolitionists. In 1854, he opened his own foundry and earned several U.S. patents for inventions in the next few decades. His foundry also produced items for the army during the war. a few days shy of his 73rd birthday.